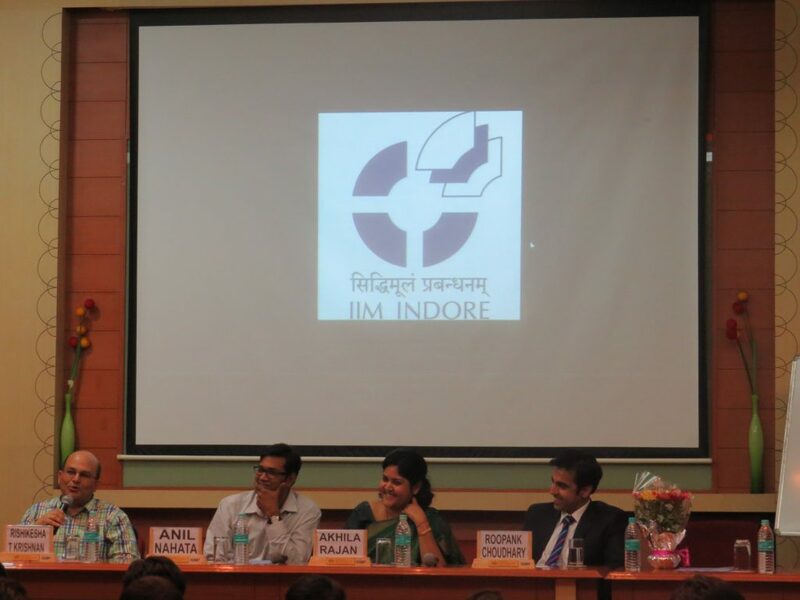 IIM Indore Mumbai Campus hosted a panel discussion on “How Increasing Access to Information is Affecting the Consulting Domain” on 04 November 2014. The panelists for the discussion were Ms. Akhila Rajan, Associate Director at PWC, Mr. Anil Nahata, Managing Partner at Nahata Consultancy Service, and Mr. Roopank Choudhary Consultant-McLagan & Head of Financial Institutions Aon Hewitt and the discussion was moderated by Prof. Rishikesha Krishnan, Director, IIM Indore. The panel discussion started with Prof. Rishikesha Krishnan’s anecdote about consulting. Various aspects of consulting were put forth in the session. The panelists shared their point of views on how consulting has changed and evolved over the years. They pointed out the present scenario by describing how much more focus is now on analytics and big data. On asked by a PGP participant about the scope of proactive consulting where the consultants preempt a problem and provide preventive solutions to it, the panelists explained how proactive and reactive consulting are dealt with in the industry. Hailing from varied backgrounds in terms of industry experience before getting into consulting, Ms Akhila, Mr. Anil and Mr. Roopank shared their insights on different industries that they worked in and what triggered them to take up consulting as their career. They also shared with the students, the challenges of a consultant. The panel further discussed about the importance of generalized consulting and specialized consulting and shared their opinions on the current situation with respect to generalized and specialized consulting. For the students of PGP-1 and PGP-2, the panelists cited the core competencies that a consultant needs to have in order to succeed. The session ended with each panelists advising the participants to identify their true calling and take their decisions accordingly. Both the PGP batches had a great experience by listening to the words of wisdom from Ms. Akhila Rajan, Mr. Anil Nahata, Mr. Roopank Choudhary and Prof. Rishikesha Krishnan.